Hi everyone, I'm honoured to be asked to set this fortnight's challenge on Crafty Muse. I decided to go for a sketch, so I hope you'll join in with us all. Here's my card for it. I used the birthday Angelique and water-coloured her in using brush markers. Thanks for looking. Now hop over to Crafty Muse to see the sketch. I loved this sketch Sarah!! Your card looks brilliant!! I love the colours! so bright and lovely and warm!! 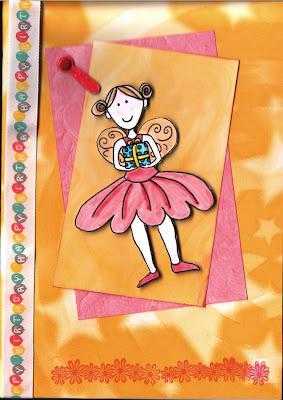 I love the colours you've used on this card, Sarah! Very bright and cheerful! Thanks for the challenge - I love sketch challenges! Such a pretty card Sarah and thanks so much for a wonderful sketch!